Split-ring floating head exchanger with removable channel and cover. U-tube exchanger with Bo-net type stationery head, split flow shell. Pull through floating head kettle type stationery head integral with tube sheet. Fixed tube sheet exchanger with removable channel and cover, bonnet type Rear head milti pass shell. 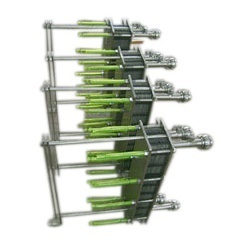 Fixed tube sheet exchanger having stationery rear heads integral with tube sheets, single pass shell. Plate Heat Exchangers with plates of SS 304, SS 316, SS 304L, SS 316L, hastelloy, Inconel, having gaskets of nit-rile, vi-ton, EPDM with brazed type, semi-welded, fully welded PHE.We offer high performance plate heat exchanger which is designed to exact requirements. Our plate heat exchanger is a type of heat exchanger that uses metal plates to transfer heat between two liquids. 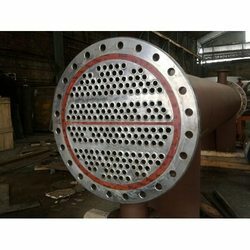 This has a major advantage over a conventional heat exchanger in that the liquids are exposed to a much larger surface area, as the liquids spread out over the plate. This facilitates the transfer of heat, and greatly increases the speed of the temperature change. Our plate heat exchangers are significantly smaller in size, and are a more efficient than their counterparts.